We decided that on this return from Butterfly Lake we would use our days off to hike the Kesugi Ridge Trail in Denali State Park. Many people have recommended that we hike this trail, so it was on our Alaskan to-do list. The views from the ridge are supposed to be spectacular on clear days, and if you are lucky, Mt. McKinley (aka Mysterious Mr. McKinley, M3, Magnificent Mysterious Mr. McKinley, M4… our names from the trail go on and on…) will even be visible. 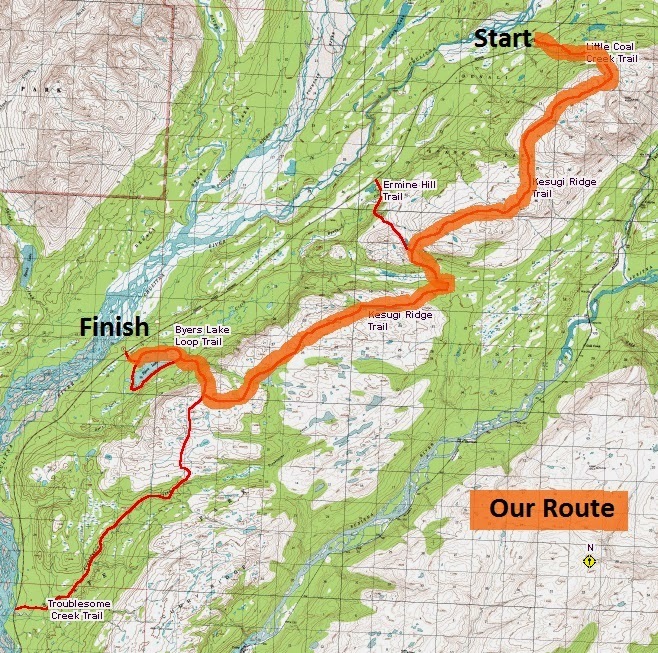 We decided we would hike the trail in the recommended direction of north to south, beginning at Coal Creek Trailhead and following the trail for 29+ miles to Byers Lake. We only had one logistical problem to solve, the fact that this was an end to end hike and we only had one car. Vic helped us out here, and recommended we get in touch with Caleb, a Denali State Park employee who might be able to pick us up at Byers Lake Campground and drive us the 17 miles north to the Coal Creek Trailhead to begin our backpacking trip. After getting in touch and making arrangements, we were set! Caleb would meet us at 9:00AM the next morning. After our weekly grocery run to Wasilla, we organized the gear for our overnight trip. We filled our packs with sleeping bags, sleeping pads, puff jackets, rain gear, a camp stove and a pot, sporks, a water filter, headlamps, base layers, extra socks, meals and snacks, other small gear, and a toothbrush and toothpaste…. no one wants stinky breathe! With our pack weighing about 25 and 30 pounds each, we were thrilled with how light they felt! We haven’t carried packs in a while that weren’t full of a weeks worth of food or for a multi-day backpacking and/or climbing trip, so this really was a treat. The standard recommendation for this trail is 2-4 days. Based on our own experiences and also the amount of “free time” available we figured 2 days should be sufficient, we even toyed around with the idea of ditching most of the gear and making it a day hike. However, since we haven’t been doing a lot of hiking recently, we decided to play it safe and plan for an overnight trip. Our goal was to get a minimum of 15 miles in on Monday, and finish the remainder on Tuesday. We woke up at 5:45 AM on Monday, making sure we had time to eat a good breakfast and make coffee before hitting the road at 6:45 AM. We also wanted to stop at a store along the way and pick up some fresh donuts as a thank you for our ride…who doesn’t like donuts? Sadly, the store wasn’t opened when we arrived. We arrived at Byers Lake Campground shortly before 8:30 and talked with the campground host about where we could park our truck. Caleb met us at 9:00, we loaded our packs in the bed of his truck and we headed off for Coal Creek. We enjoyed getting to talk with Caleb on the way to the trailhead, and also saw our first bears in Alaska! A black bear sow with two cubs made their way across the road in front of us. Sadly, our camera was in the bed of the truck! None the less, we enjoyed watching the cute and tumbly cubs frolic across while mom looked on. We signed into the nicest trail register station we have ever seen, and were hitting the trail at 10:00 AM. We began on a very nice trail, that meandered upwards. We knew we had 3.3 miles and 2,200 feet of elevation gain along the Little Coal Creek trail in order to reach the official start of the Kesugi Ridge Trail. The trail had a few sections we thought we steep enough to really make our muscles work, but overall we did not find the ascent to be terrible. 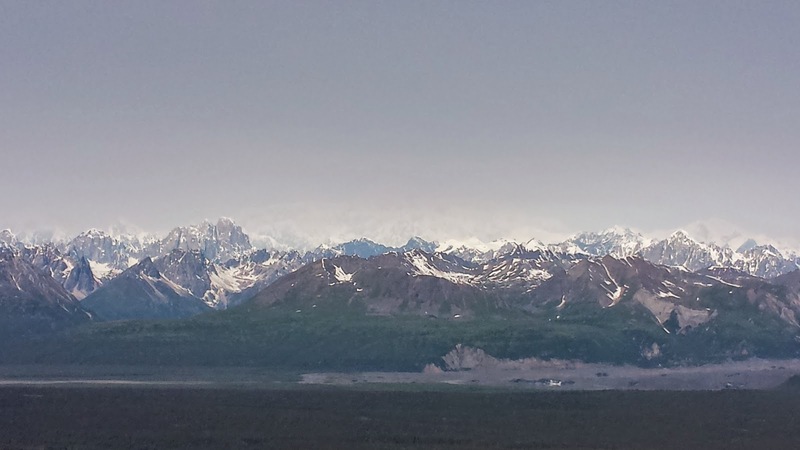 After reaching the ridge, the amazing views of the Alaskan Range appeared. McKinley was hiding in a veil of clouds, and we could only get foggy views of him, but the other peaks were clear. Traversing the ridge was fantastic hiking! We were giddy with excitement over how easy the trail was so far and how spectacular the view. You wanted to walk with your head turned to the right to keep watching the snowy mountain peaks. 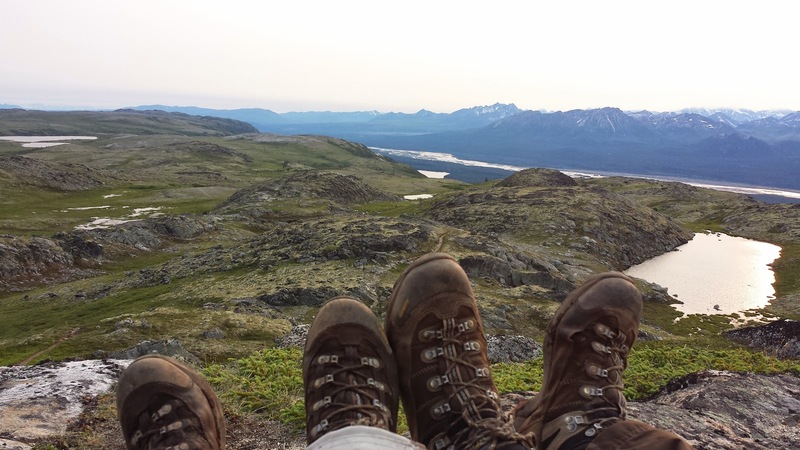 We were feeling so great in fact, that we began discussing, once again, the idea of finishing the trail that day, and even heading to Talkeetna for celebratory caribou burgers. In our minds, we were through the worst of it (gaining the ridge), we were making good time (we passed 3 other groups of hikers), and our bodies felt great. The only negative was that one of Alex’s hiking poles had broken, so Dave donated his to her, and he hiked with only one. We decided we would make up our minds after we reached the trail junction with the Ermine Hill Trail, about 14 miles from our start. At Ermine Hill, around 3:45 PM, we met a tired and sweaty looking backpacker who was making his way up the trail from the South. We exchanged information about what we had seen on our sections. We told him the trail was pretty easy, would have a few steep up/down sections, but overall was great. He told us the trail would drop a lot of elevation into tight alder, muddy ground, and mosquitoes, before regaining the ridge, but after that it was clear sailing. We then rounded a curve in the trail, and picked out a shady area along a rock wall to make a good lunch (more than the Lara Bars, trail mix, and dried fruit we had as snacks so far) since we decided we would aim to finish the trail that day. We also took the opportunity to give our feet a break from the boots, and change out our sweaty socks for fresh ones. Feeling refreshed, after filling our bellies with a homemade dehydrated Mexican Beef backpacker meal (Thanks Joel!) and letting our feet take a breather we hit the trail once again at 5:00 PM. The trail worked its way into some interesting rock formations, before beginning a steep descent of nearly 1000 feet to the valley bottom. This area consisted of some of our most hated trail sections through tight trails choked with alder and swampy ground. It also was the type of area along the trail where we made sure to talk loudly or just yell out random words to make our presence known to any bears lurking in the alder. During this time Alex was questioning (in her head) the feasibility of finishing the trail today, while Dave maintained confidence that the tent would not be pitched that night since Alex had already committed to completing the trail… though maybe now burgers would be out of the picture. The trail curved to the end of the next ridge before beginning to ascend once again towards the Skinny Lake camp area. This section of trail was much nicer, especially once we hit the point where it was quite obvious the trail crew had ended their previous day of work. We were expecting to run into the Denali trail crew at Skinny Lake; Caleb had mentioned to us that they were stationed there. Around 7:00 PM, a large blue tarp came into view that marked their camp. There were only two people at the camp, one of which was the trail crew leader who had picked us up from the airport in Anchorage. We stopped and talked for a few minutes, and they told us we had around 10 miles to go in order to reach Byers Lake. They told us we would have to summit the next mountain, reaching the high point of the southern section at 2,970′ know as “The Golog” from which we would be able to see Byers Lake a few miles in the distance. Despite the mileage ahead of us, now that the alder choked valley was behind us, we were, once again, both feeling confident that we would complete the trail that night, but burgers were definitely not going to happen. Reaching the Golog involved several steep drops and climbs, some which again brought us through muddy pits and choking alder, but we were quickly through each of them, so they were not that bad. When we reached to Golog, we sat down for a few minutes to have a snack. It was quite windy here and Alex donned her rain jacket to help break the wind that was blowing against her sweaty shirt and making her cold. From our perch on the Golog, shortly before 8:30 PM, Byers Lake was a welcome site. We estimated that we should easily be to the car before midnight. We began our descent, with the anticipation of being off our feet becoming a close reality. Alex was able to ward off blisters for most of the day, but within about the last 6 miles she began to feel one begin, while Dave’s hardy feet were getting sore, but blister free. The terrain was rolling alpine tundra as we eagerly watched for the Cascade Trail junction that would let us know we were within four miles of the campground. Over every high point we eagerly hoped it or the site of the now unseen Byers Lake to appear. We stopped to filter water, and looked at our map. It looked as if the sought after junction should be appear on the other side of the hill top in front of us. And it was! Byers Lake… not as close at it looks! Refreshed by again having water which we had gone several miles without, and knowing the remaining mileage our demeanors perked up. 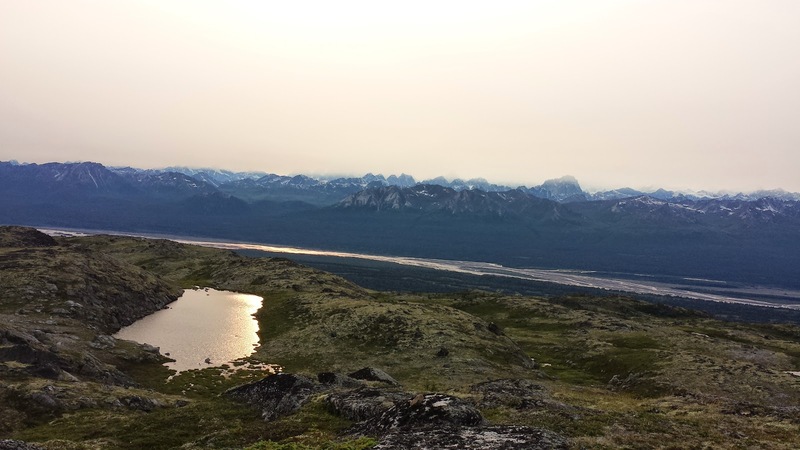 The Alaskan Range’s foot hills became visible as trail began to descend to the valley. The combination of tiredness setting in, feet beginning to ache, and the very long, slowly descending, switchbacks made this a section of trail a piece we just wanted to be done with. The switchbacks brought us into tight alder sections and water crossings that wandered through the valley curving back and forth, working their way closer to the lake. Again came loud talking, random words, and clanging of hiking poles to be “bear aware” as dusk began to set in. As we reached the sign that told us we were 1.8 miles to the campground where our truck awaited our return, we were still doing our best to keep spirits high, but Alex was falling into a sore, tired, mumbling state, in which all concern fell on making noise to keep bears away as we followed the trail through the forest. Dave did his best of clanking a rock against the one hiking pole he carried to appease her, though at this point all he could come up with was the tunes of “Rudolph the Red Nosed Reindeer,” “Jingle Bells,” and “Frosty the Snowman.” Finally, the campground came into view, and we only had to walk a short distance to the boat launch area where we parked. Your vehicle is always the most welcome site at the end of a long day, and we were joyous when it appeared at 1:00 AM. We were both very excited at what we had accomplished in 15 hours, with packs whose contents and weight were mostly unused, as we pulled off our boots and donned comfy flip flops. With Alaskan days shortening, it was now pretty dark at 1:00 AM, and we realized for the first time that the tail lights in the truck did not work. Hoping to make it back to the station without getting pulled over, Dave would lightly hold the break peddle down to engage the break lights whenever other cars were around. Instead of caribou burgers, we had gas station chicken fingers and Gatorade’s as we made the drive back to the station. It was 3:00 AM when we entered the gates and parked. Though exhausted, hot showers sounded fantastic before gingerly and clumsily crawling up to our loft to sleep.